P. and J. have escaped from the kitchen at Greenies to explore second life. And they have been running into all kinds of trouble. Episode two was already shot at my salon, and now there's episode five in which P. loses her cherry to my punk rat avatar. She forgot to tighten it. Don't worry, there's a happy end when J. gets it back for her. Steff Ling has made five great Pud and Jel videos so far. And there's more to come I hope. Apparently Rat was a bit of a slacker during the shoot, as you can read on Steffs blog. On its blog it complains about the rat being a lazy actor. There's a better quality video of this episode on blip tv. Keiko Takamura got killed by a monster in my salon! Ah well, fear not; it's only virtual ketchup. Read about the video and the song on Hamlet Au's New World Notes. 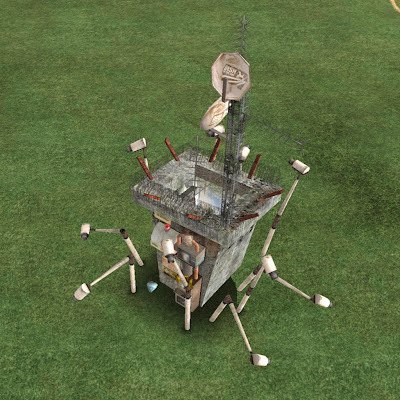 Olza Koenkamp is a polish artist that I spend a lot of time in the sandbox with. 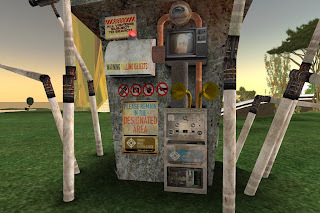 I love the avatars and art he makes; defenitely among the weirdest and greatest in SL. Some time ago he opened his first (main) store and I asked him if he wanted to make a statuette at my land in Oculea to serve as a landmarkgiver to his new shop. Go check out his psychosomatic rebuilders shop! The avatars are awesome. 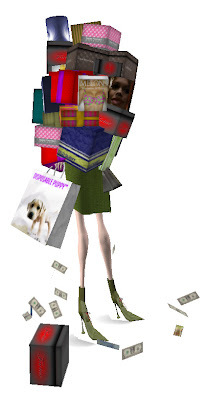 Made a shopping addict avatar; two skinny legs under a pile of bags and packages shedding money and credit cards. My favorite scripteuse Paladin Pinion did the script, based on Arduenn's drop script that I used for the driveable dumpster. It has all the famous brands; Fartier™, Lag™, Yves Sans Lag™, Bling™, and of course Torley Linden™'s brassiere brand Melons™. I gave a copy to Torley (which he apparently appreciated :) and I just noticed he wears it in one of his awesome tutorial video's. Yay! Available for L$ 250 at my shops. The Global Kids digital media initiative (sponsored by the MacArthur foundation). opened the International Justice Center in Second Life. As part of the opening ceremonies (which also featured RL streams of Luis M oreno-Ocampo and Kofi Annan a.o.) there was to be an art show themed around justice, curated by Bettina Tizzy and In Kenzo. I was honored to be asked to join great builders Pavig Lok, Tuna Oddfellow, AM Radio, Juria Yoshikawa, Dancoyote Antonelli, Filthy Fluno, Elros Tuominen, Chance Abattoir, Adam Ramona, Josina Burgess, Velazquez Bonetto and Junivers Stockholm in the art show. I made an inside out jail, with the free world inside. With privacy laws being trashed in the name of security all over, the world is looking more and more like one big jail, right? It has a bunch of cctv's moving about (I used puppeteer to do that) and a script (custom made by the wonderful Paladin Pinion) that does a full 'scan' of your avatar when you get close to the sculpture. 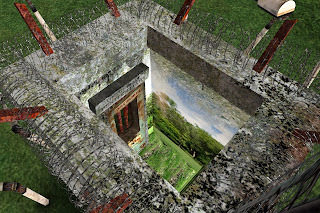 The inside has a wallpaper of a garden and a door that says 'universal penitentiary'. 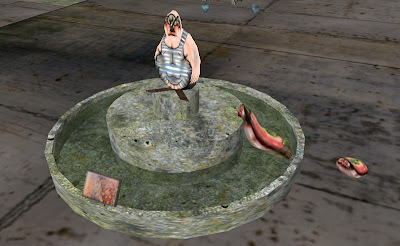 The sculptures are still there, so go have a look at the Justice Commons sim. It's a great exhibition and worth the visit. There's been a lot of blog coverage of the show, some youtube here and youtube there, and there's the large post on Bettina's npirl blog. If you find more, please leave a link in the comments will you?